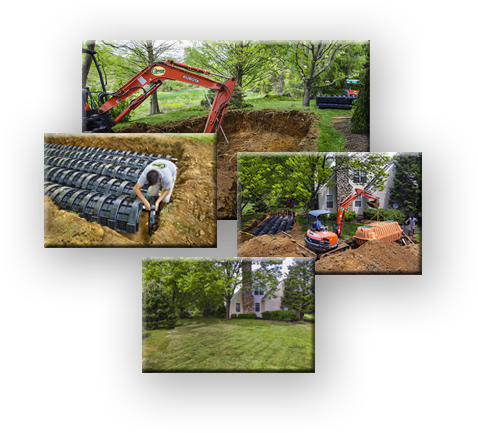 Quantum Environmental Enterprise provides professional, prompt and environmentally safe septic maintenance in PA and DE for your home or business. Our goal is to provide our customers with exemplary service. Whether you have a septic system emergency requiring immediate service, general maintenance, real estate inspection, or a total design for new construction or replacement. We are prepared to serve your needs! No job is too big or too small for Quantum Environmental. We install all types of septic systems. From soil testing to installation / replacement our experienced staff is there every step of the way. Quantum’s goal is to install the best system for your site and personal needs. Soil testing is the first step in designing your septic system, in addition our staff also considers other factors including existing and future structures or additions, driveways and landscaping plans. Solids or sludge will continually build up at the bottom of your septic tank, much of this sludge is not biodegradable, the solid material must be pumped out on a regular basis to avoid overflowing the tank and or overflow into the absorption field requiring further more expensive work. 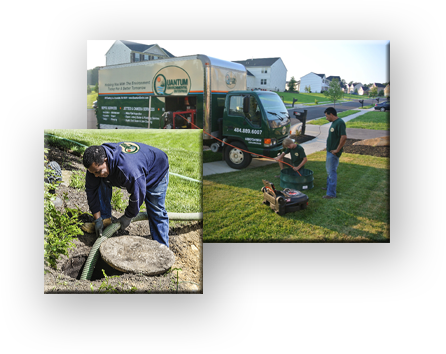 The team at Quantum Environmental provides septic pumping services throughout Southeastern, PA. Whether new or old Quantum can pump your septic system. Including standard, sand mounds, pressure systems, holding tanks, cesspool or wet well. If your township requires a septic inspection our certified technicians can provide this while pumping your system. To minimize expensive repairs and assure a properly working system a regular schedule based on the type of system and number of household occupants is recommended. This schedule must meet the minimum pumping interval that may be set by your township. PSMA member companies are committed to the compliance with all state and local standards and regulations. The use of the PSMA / NOF inspection standards is restricted to those who have completed the required training and testing. When performing a PSMA / NOF inspection inspectors must fully apply the standards, no part of the standards may be excluded. A Hydraulic Load Test is used to determine if a septic system’s absorption area (drain field, sand mound, seepage pit, etc.) is able to handle the PA Dept. of Environmental Protection specified volume, (400 gallons per day plus 100 gallons per bedroom for each over three). This test is required whenever the absorption area is not receiving regular use on a daily basis. If the home is occupied and the system is in regular use the absorption area is evaluated by the way the system interacts to the load imposed by its daily operation. However if the home is not occupied and in normal use (no load on the system) a Hydraulic Load Test will be required to verify that the system is functioning satisfactorily. Perk Testing is used to determine the absorption rate of the soil where a septic drain field will be installed. 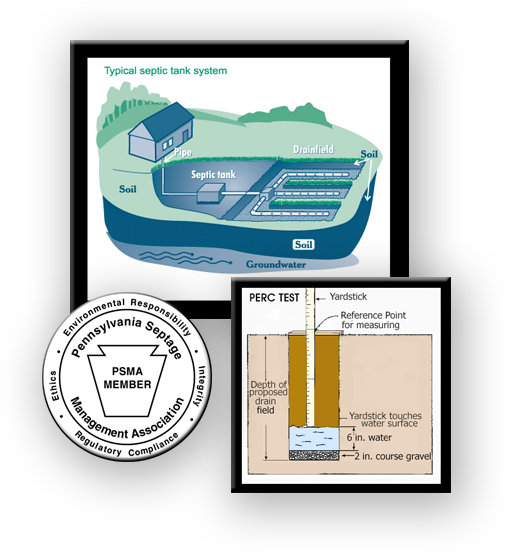 The results of a perk test are required to properly design a septic system. Perk testing is simply observing how quickly a known volume of water will dissipate into the subsoil of a pit drilled to a known size. While every jurisdiction will have it’s own laws regarding the exact calculations for line, depth of pit etc., the testing procedure is the same. Generally speaking sandy soil will absorb more water than soil containing concentrations of clay or where the water table is closer to the surface. 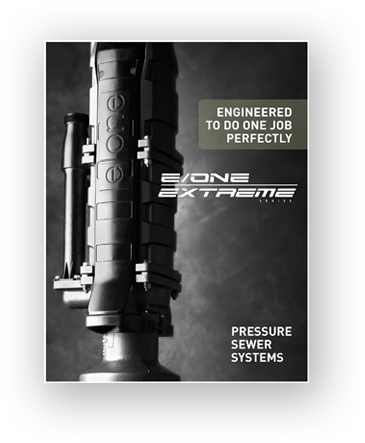 The E/One Sewer System is a pressure sewer system that is powered by E/One grinder pumps. A pressure sewer system uses small diameter piping. The difference between a gravity sewer system and a pressure system is that a gravity system uses large piping that are installed in deep trenches, pressure septic systems use pipes as small as 2” diam. allowing smaller trenches with the piping following the contour of the land, resulting in huge savings. Pressure systems are used in areas where a conventional gravity system cannot be installed, or where it is too expensive due to the terrain being very flat, rocky, hilly, or too wet.